Favourite airport on trip: Tuzla – lots of interesting aircraft from a different era. Funniest moment: We arrive into Tuzla airport at dusk, no one is at the airport and it is far from anywhere. Sitting in the car park trying to sort a hotel for everyone in the dark. We then send the only taxi driver away as we didn’t like him. Thankfully Andre sorts out a great hotel and they send a bus to collect us all. Any final words? 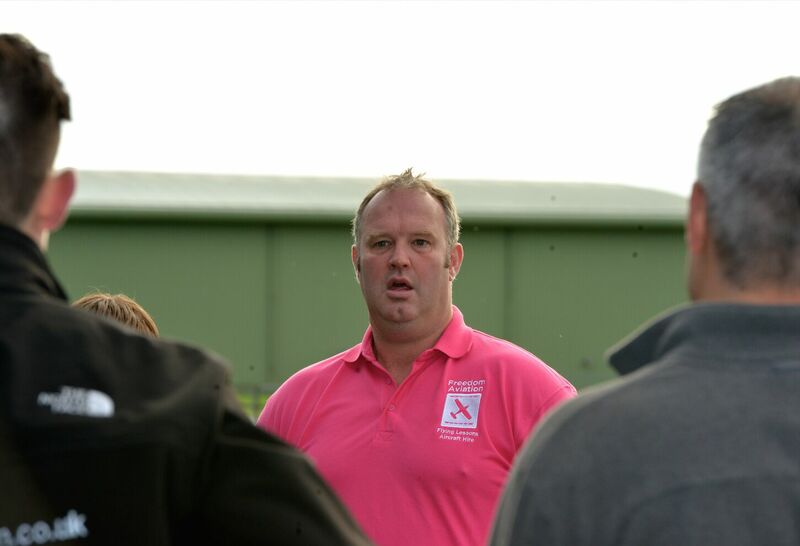 – Fantastic time with a great bunch of lads of all ages and backgrounds. Roll on 2016 trip. Any final words? – Loved it! Very long days, needed a week to recover after the trip, everybody was great company, the Monday afterwards at work was a bit dull with no adventure to look forward to that day! Funniest moment: Pods was doing formation calls, day 1 in Germany and spent ages briefing this guy as to who we all were & where we were going. The guy asked how far apart we all were. Pods said a couple of miles and the guy replied (strong German accent needed here !) “that is not a formation!” It was so funny! Any final words? – What a great trip! Brilliantly organised & supported by everyone involved. Now looking at next years trip, thinking about , France, Spain, Portugal, Morocco, Majorca & back! Funniest moment: General banter, and having budgies pick out our fortunes in Romania! Any final words? – An absolutely amazing trip, Romania is a stunning country, and offered a totally unique flying experience. As a relatively new PPL I feel that I learnt a lot, and really felt I had the support network from the more experienced pilots. Everyone really pulled together as a team, and we all had a great time. I can’t wait for next year! Funniest moment: Flying around the Carpathian mountains looking for Andrei’s Grandma’s house in Romania… and not being able to find it. Funniest moment: Getting to the airport from the hotel and suddenly realising we’d forgotten Pods! Any final words? –By far the most challenging trip Freedom have undertaken. Working with JJ to try to teach and fly close formation with a mixed ability group was no easy task. Due to the efforts of everyone involved we managed some spectacular formation flights which the Red Arrows would have been proud of, in fact, I think they have already stolen some of our routines for the 2016 display season. Funniest moment: Pods – that puts me at 300′ below the ground, you guys got the same?? Any final words? 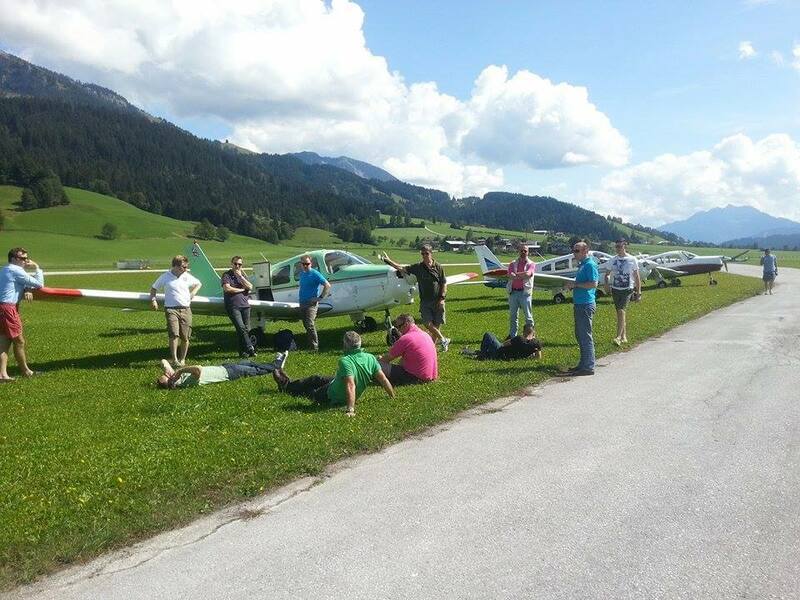 – a great trip was had by all, some outstanding flying in some of the best scenery Europe has to offer. Everyone should be justifiably proud to have made it nearly 4000miles incident free and with some great laughs. Roll on the next one! Any final words? – Fulsome admiration of the organisation, with warm praise and thanks for all the enthusiastic encouragement and support from fellow travellers for a late learner like me. Funniest moment: Very hard to pick one as there were so many! Probably the top funniest moments would be the last night in France, with Mikey taking the role of being Village Idiot & clowning around on the last few legs with Pods & Damian in Vicky! Any final words? – Unbelievable trip! Loved & enjoyed every bit of it! 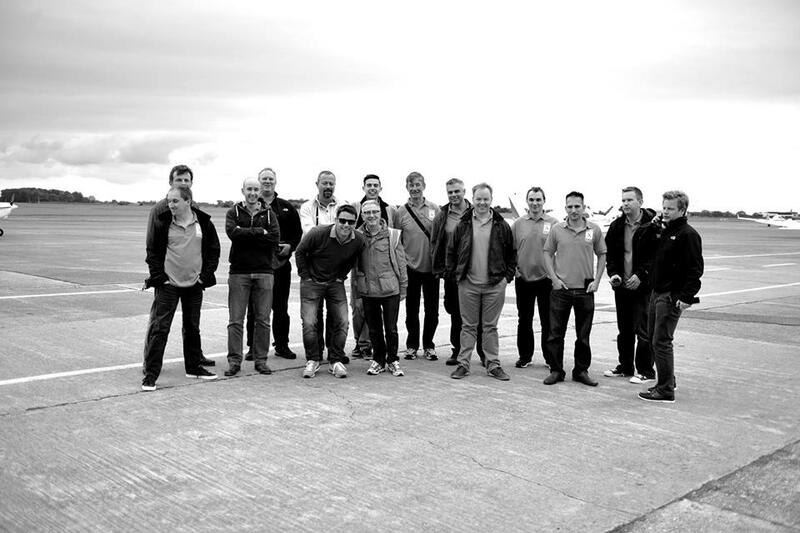 Real good laugh & fun with a great bunch of lads!! Still have random outbursts of laughter about it all!! Just like to thank everyone again for such an amazing trip! 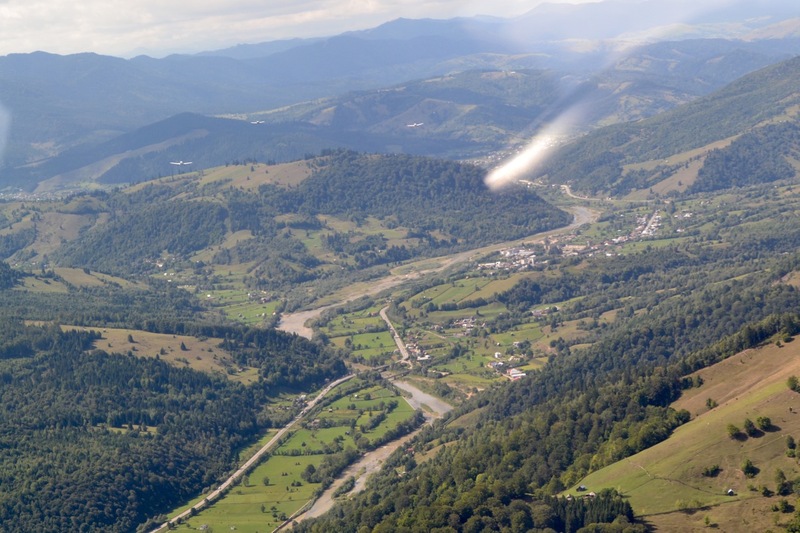 Nic Rodgers concludes his account of Freedom’s adventurous trip to Romania. Join us next week to meet the crews. After a good sleep, we headed back to the airport ready to start our final day of the trip. Our initial leg took us 140 miles to to the grass airfield of Compiegne Margny, just north of Paris. 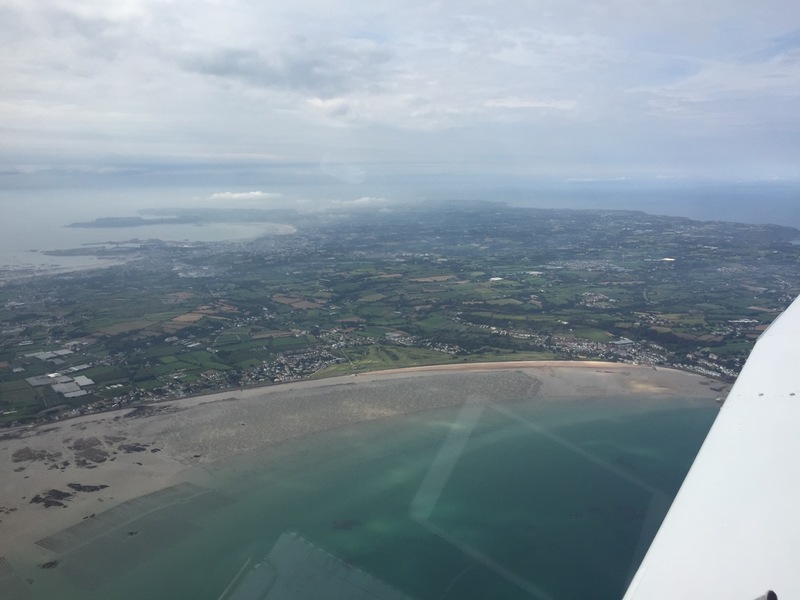 From there, we made a direct track for Jersey, overflying the historic beach at Normandy, before leaving the French mainland at the St Germain VRP for the short (10 minutes or so) over-water leg to Jersey. 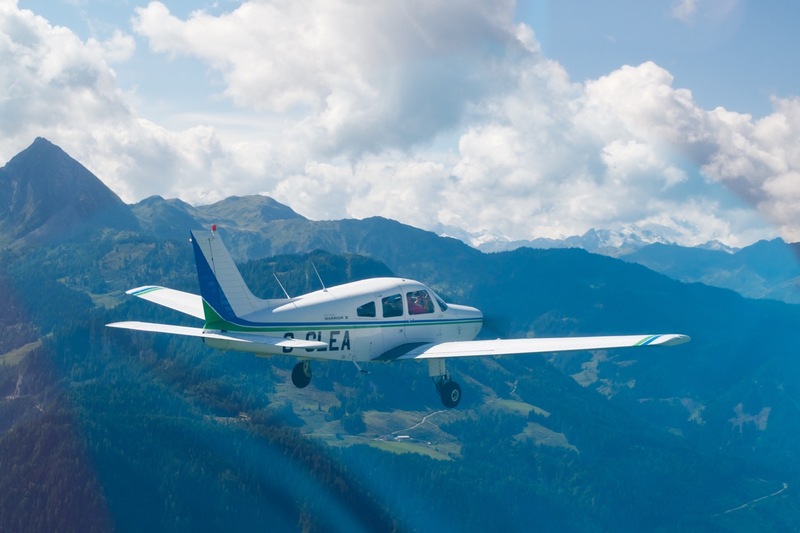 We made the most of the popular airfield restaurant and cheep fuel, a firm favourite of the British pilot because the reduction in tax makes AVGAS nearly a third cheaper than in the UK. After departing Jersey, there was sadness in the air that this would be our final leg of the trip. But there were mixed emotions and as we flew over the familiar Compton Abbas a certain warm fuzzy feeling makes you feel good to be home. Each aircraft flew a slightly different route back to Kemble, with about twenty minutes between the first and last aircraft landing – formation landings a distant memory already. We helped empty, tidy and clean the aircraft, before pushing them in to the hangars and wrapping them in their overnight covers. We then slowly and reluctantly bode farewell to each other before heading back to our families and friends. 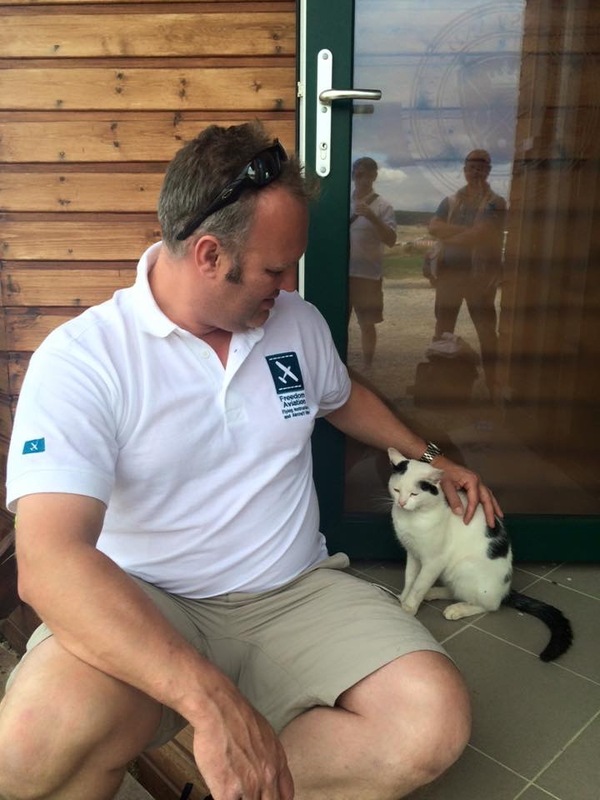 Nic Rodgers continues his account of Freedom’s adventurous trip to Romania. Join us at 6pm every day this week to relive the trials and tribulations. 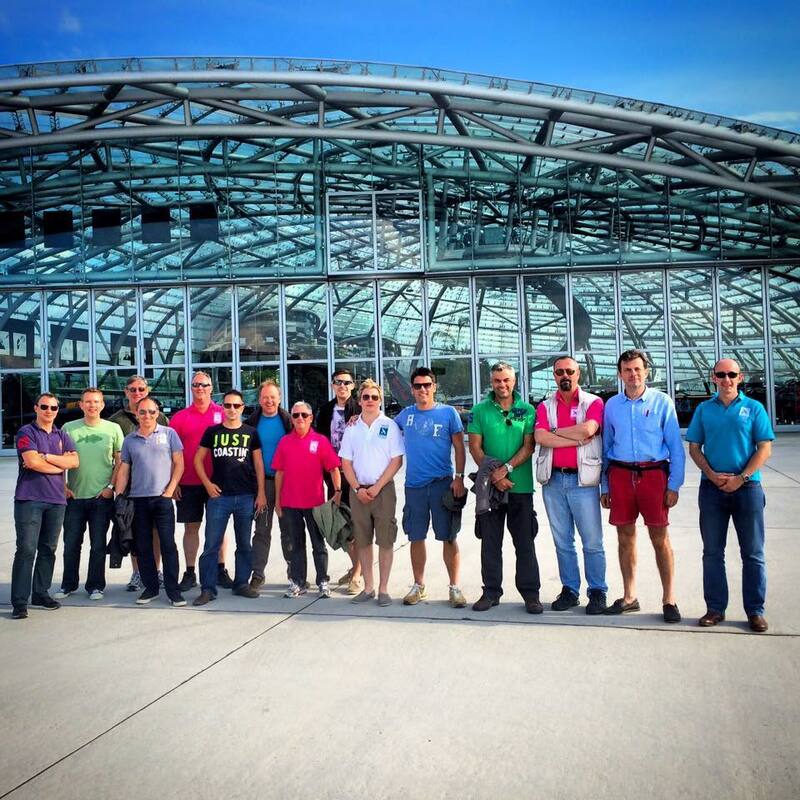 After heading back to Graz, we prepared the aircraft and reviewed the weather. Unfortunately, as is fairly typical in mountainous regions, there was a layer of fog which would keep us grounded for a couple of hours. Luckily Graz is a fairly large airport, with plenty of shops and cafes to keep us occupied whilst we waited for the weather to improve. 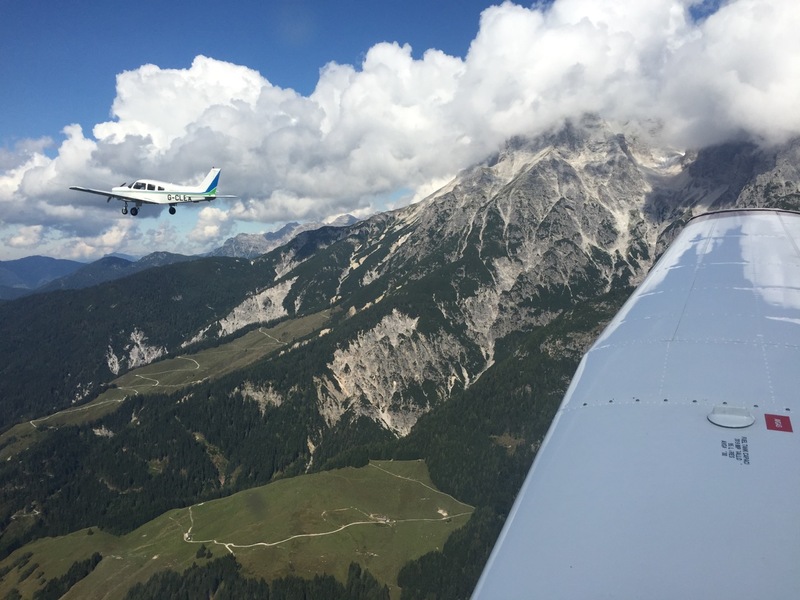 Eventually, the fog lifted and our route through the Alps was clear (GAFOR routes are helpfully shown in SkyDemon) so we headed out to the aircraft and were quickly airborne. This was – undoubtedly – the most beautifully scenic leg of the entire trip. 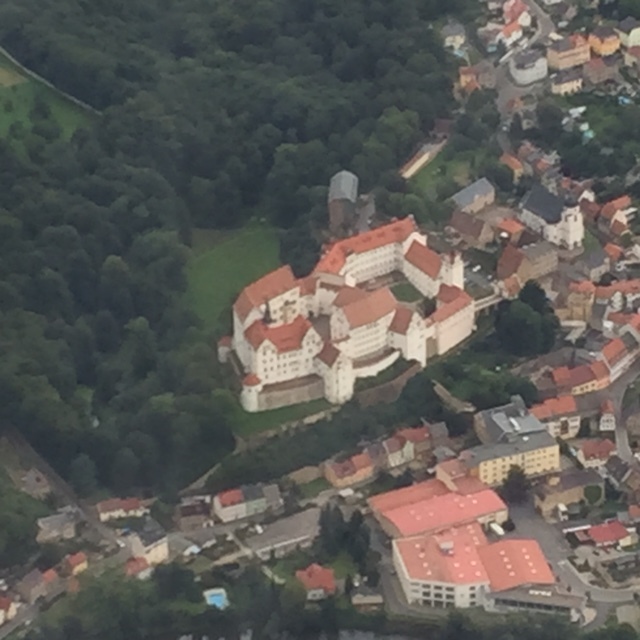 As we departed Graz, we initially headed North, before turning West and passing Aigen Im Ennstal (who were keen to take up our offer of a tower fly-by!) 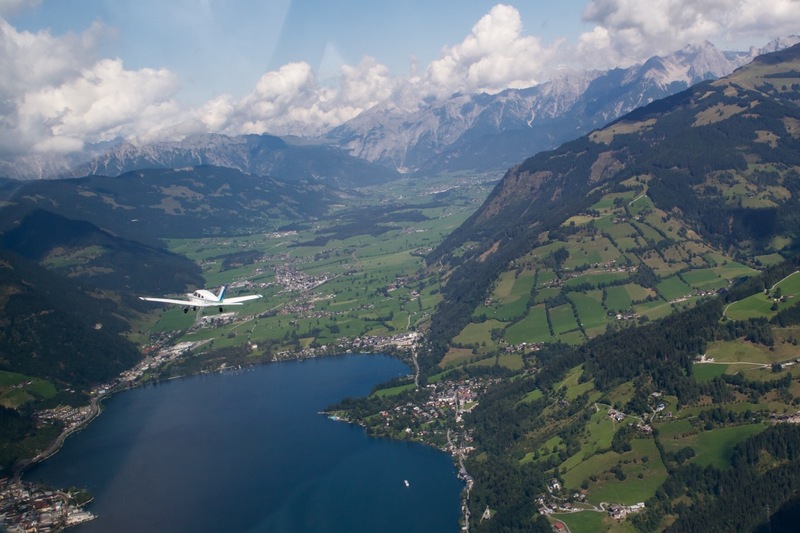 and Zell-Am-See, before turning North/North West and landing at St Johann/Tirol. This was 180 miles and 1hr 40min of what must surely be some of the most breathtaking flying you can do anywhere in the world. 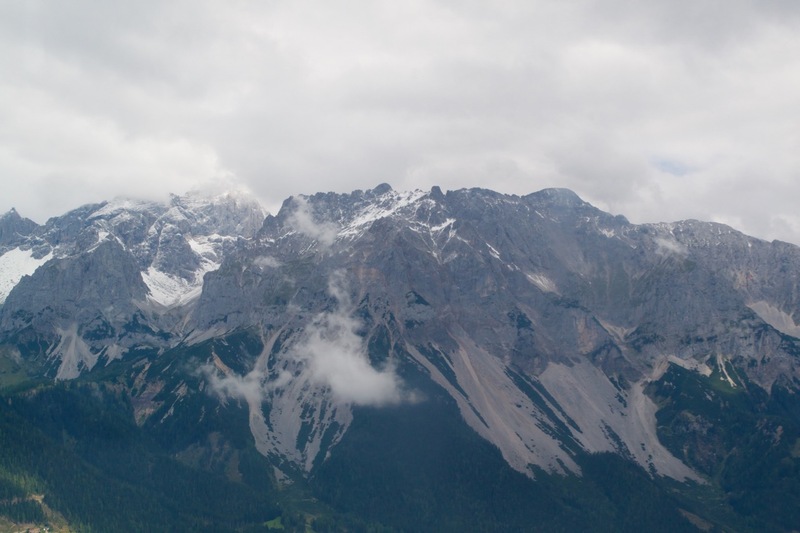 There is something magical about flying down the valleys, surrounded by the huge, daunting landscape of the Alps as the mountains rise to over 13,000ft around you. 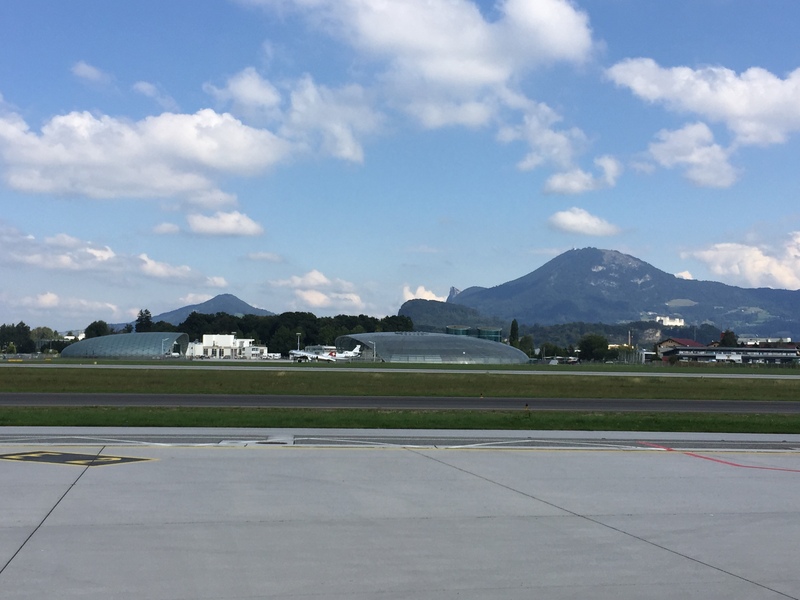 I don’t know if there’s a global competition for the title of ‘World’s Most Beautiful Airfield’, but if there is – St Johann would surely win. Nestled at 2,200ft in the picturesque valley basin between the mountain range of the Wilder Kaiser and the Kitzbuheler Horn mountain, St Johann is picture-postcard-perfect in every way. We landed just before the daily 2 hours of noise abatement, where no aircraft are allowed to arrive or depart, so we took advantage of the popular airfield restaurant. 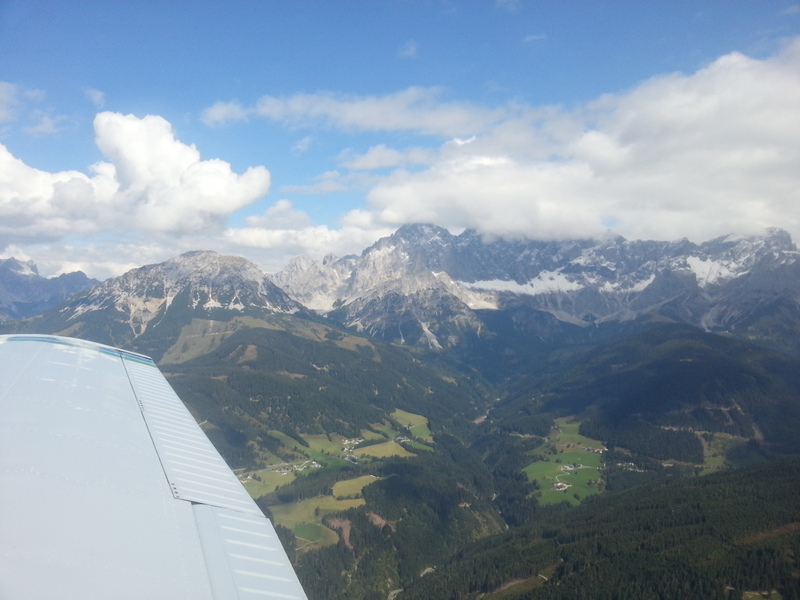 We could have happily stayed all day, but after 2hrs, it was time to say goodbye and leave, making the short hop to Salzburg International airport. Salzburg International is the home to the famous Red Bull Hangar 7, a unique building holding all sorts of incredible Red Bull aircraft and Formula One cars. We were lucky enough to be invited for a private tour around Hangar 8. Normally closed to the public, Hanger 8 is the working maintenance hangar that services the entire Red Bull fleet. During our tour we got to see a huge collection of aircraft – old and new – all of which were perfectly polished and spotless. We could have had a full day at Hangar 7 (it even has 4 restaurants!) but our return journey beckoned. 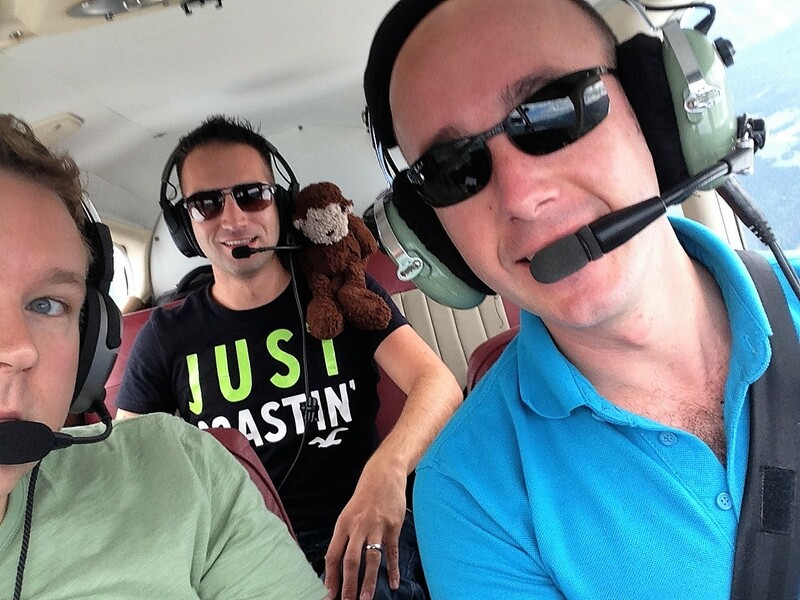 We headed back airside, refuelled, and got airborne, heading west to France. Our plan was to crew change in France, before continuing onwards to Jersey where we would spend the last night of our trip. However, it was clear we were a little too ambitious in this plan as we had spent longer at St Johann and Salzburg than we thought. After landing at Epinal Mirecourt, we decided to spend the night in France. Unfortunately, there’s not a lot happening in the vicinity of Epinal Mirecourt, so finding accommodation for fifteen of us could have proved difficult. So instead of stopping there, we searched for alternatives. We decided on Metz Nancy Lorraine, 40 miles to the North, which offered us the attraction of a large town, plenty of accommodation, good restaurants and – crucially as it was now dusk – a runway with lighting! We re-jigged the crews on each aircraft slightly so we had a pilot with a Night Rating in each. The short 20 minute trip to Metz Nancy Lorraine, for some of us, this was the first night flying we’d seen. Personally, I was mesmerised by the beauty of night flight. The air was so calm, the flight so smooth, and being able to see the twinkling nights of the city was another memory of the trip that I’ll never forget. I think quite a few of us are ready to sign up for our Night Rating courses this Winter after this one leg alone! The staff at Metz Nancy were fantastic, helpfully offering to arrange accommodation and taxis for us, and would definitely win the award for most friendly and helpful airfield of the trip. Upon landing it seemed as if the airport was ready to close down for the day, so it was really lovely that the staff at Metz Nancy took the time to make us feel welcome. Day 5 was seen in with a very leisurely breakfast – Andrei even managed to sleep through his alarm! We needed all the energy we could get for the obligatory push-the-aircraft to the fuel pump routine at Ineu airfield. After refuelling, we thanked our hosts, said goodbye, and made the short 10 minute hop back to Oradea to complete customs. Passports checked, bags x-rayed – but no sign of the paparazzi this time – we flew to Heviz-Balaton (Sarmellek) in Hungary. We decided to take a slight detour on this leg, heading further south and close to the border of Serbia and Croatia, via the Hungarian town of Szeged, to do some sightseeing. The route took us across some stunning forest trails and rivers, including the Danube and the Barva, which winds along (and defines) the border between Hungary and Croatia. Heviz-Balaton airfield was very similar to Pecs – large, modern and well equipped, but apart from a small number of airport staff, nobody else was around! Luckily customs were though, so we completed the paperwork which signalled our arrival back in to the Schengen area. 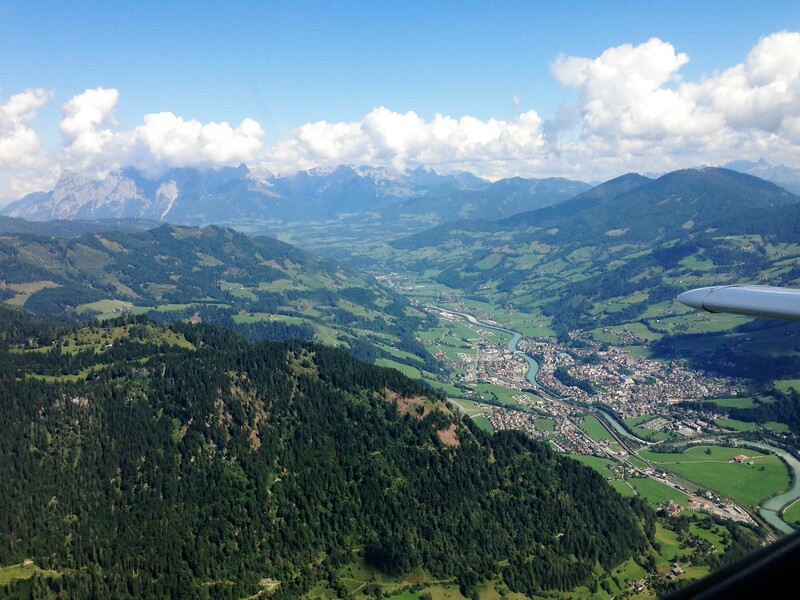 From here, we headed to the Alps, where we planned to overnight in Zell-am-See. 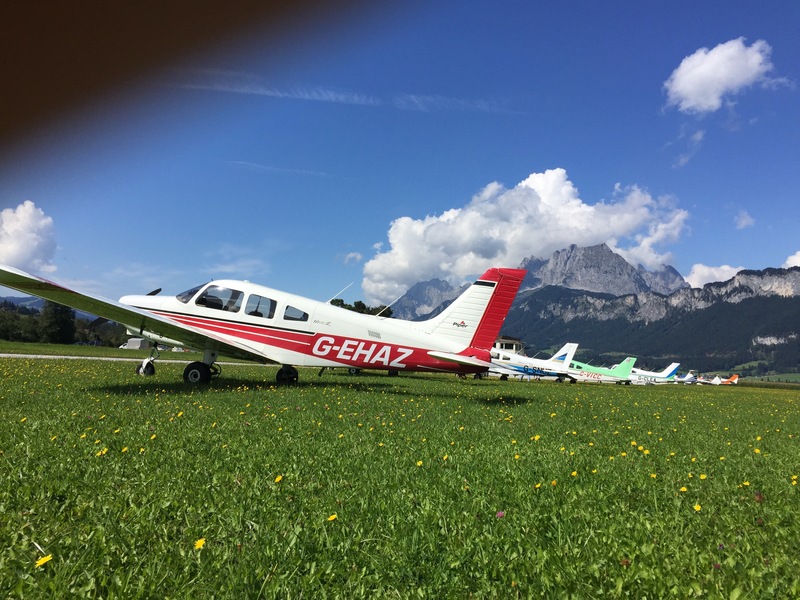 As we made our way towards the Alps, a number of weather diversions (to keep us VMC) had extended our flight somewhat, and it was looking less and less likely that we’d make it to Zell-am-See before nightfall. Flying at night through the Alps – whilst perfectly legal – isn’t exactly the sort of thing you’d want to do for fun. 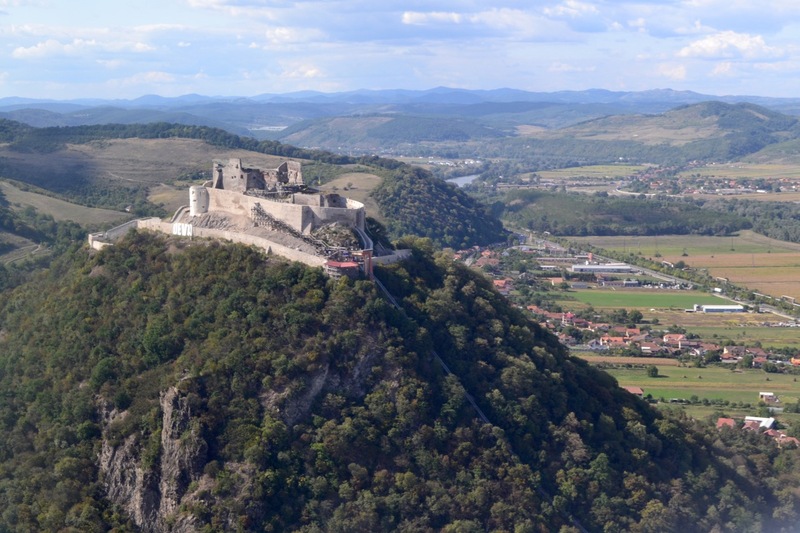 With safety being of paramount importance to the group, we decided to divert to Graz, where we would spend the night. I hadn’t made a diversion before, but found the whole process to be remarkably easy and pretty much a non-event. After contacting Graz on the radio and advising them of our intentions, they couldn’t have been more helpful. They cleared us to enter their controlled airspace to land, fitting us in with their scheduled commercial traffic. Once safely on the ground, we were in the best position to watch the a beautiful sunset over the Alps whilst patting ourselves on the back for making the right choice. After a couple of minutes on the iPad, we’d sorted accommodation for the night, and joined the taxi queue. Our hotel looked – and felt – authentically Austrian, just like the sort of thing you see in the movies. A wonderful evening was had by all, enjoying Austrian delicacies like Schnitzel and Apple Strudel, with some refreshing drinks to swill it all down. Day 4 and we were up bright and early. After a quick of breakfast we headed back to the airfield. 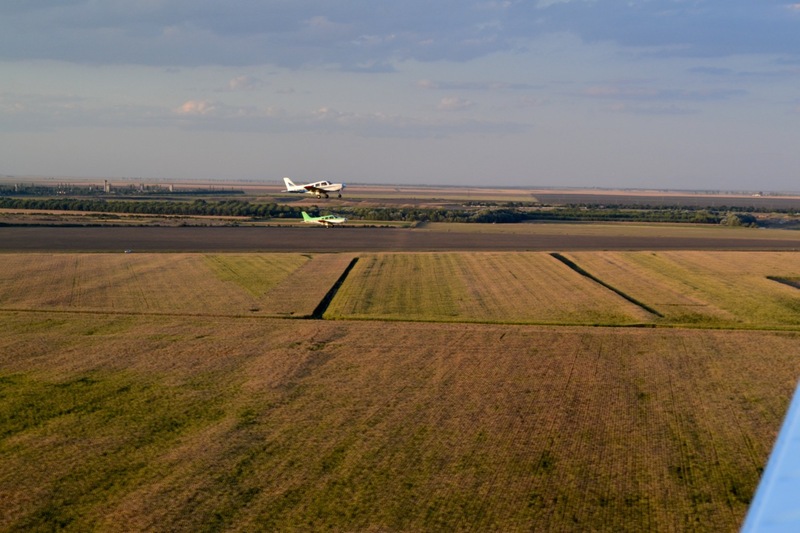 Our first leg took us to Clinceni / Bucuresti Airfield, on the outskirts of the Romanian capital. 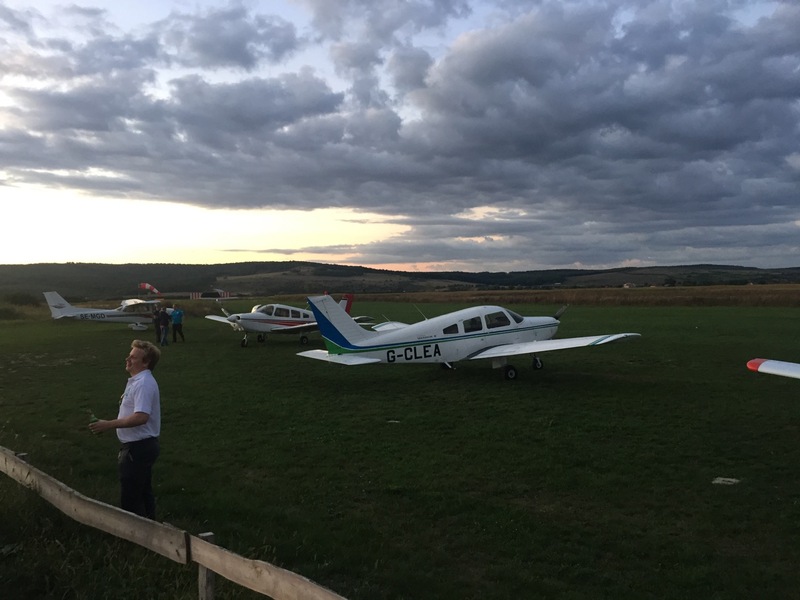 It’s a lovely grass airfield, home to the Hawks of Romania, the Romanian National Aerobatic club, as well as numerous glider and flying schools. We stopped for about half an hour, just enough time for a toilet and tea break, and were lucky enough to get a sneaky peek of the Hawks rehearsing. 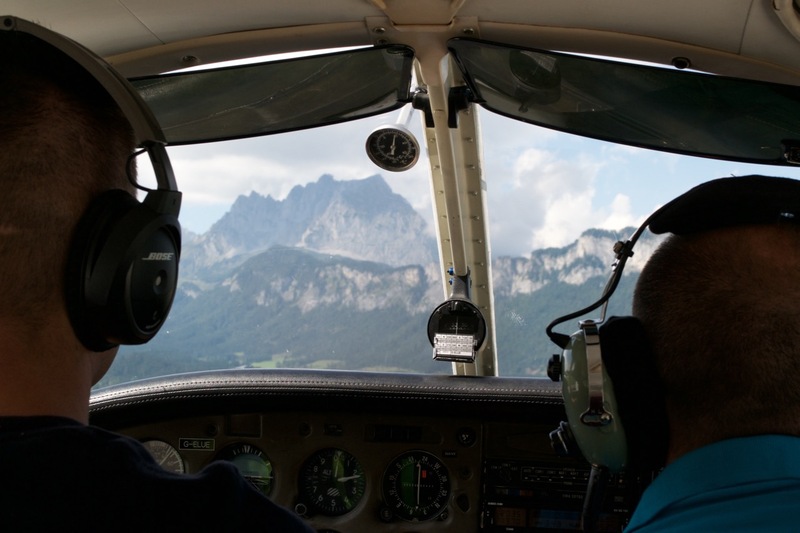 From Clinceni we headed to Deva Aeroclub; a pleasant grass strip nestled in between mountains. We stayed for a while, giving us a chance to snack, rest and bask in the sunshine. After refuelling, we set off back to Ineu, flying past the the Deva Citadel, dating back to the 13th Century. A short leg of just 45 minutes passed initially through the stunning mountains of Transylvania, before the dominant hills faded away to leave the flat land of the Crișana region as we approached Oradea. After being welcomed back to Ineu by our new Romanian friends, we checked into our hotel for our last night in Romania. This was the shortest day of the trip, with us firmly settled into the hotel bar by 6pm. This gave us a couple of hours to relax and make the most of the shiny new swimming pool (sadly the hot tub was broken!) before joining our Romanian hosts for a traditional dinner in a local restaurant. We awoke and hailed some taxis to take us back to Ineu, where we hoped to begin the daily ritual of refuelling the aircraft. However, some logistical issues delayed our refuelling so we had a couple of relaxing hours to rest and admire the beautiful scenery. Once refuelled and ready, we crewed up and got airborne. Our first stop was Cluj Aeroclub. Cluj is home to a fairly large international airport, but we would be flying to Cluj Aeroclub, just a couple of miles to the south of the main airport. 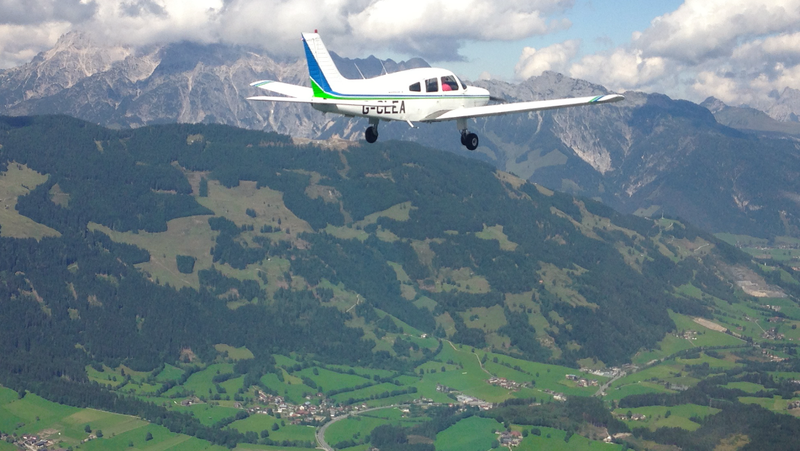 After a quick crew change, we were back airborne and heading to Tgmures Aeroclub, via Andrei’s house. The first leg took us to the North West of Romania for some sightseeing of the stunning mountains and valleys Romania has to offer. We even had a chance to fly-past Andrei’s family home. Andrei (Freedom member, legendary chef and currently studying for his ATPLs) was the reason we decided on Romania for the 2015 expedition. His local knowledge was invaluable during the planning stages, so the opportunity to fly past the family home was too good to miss. 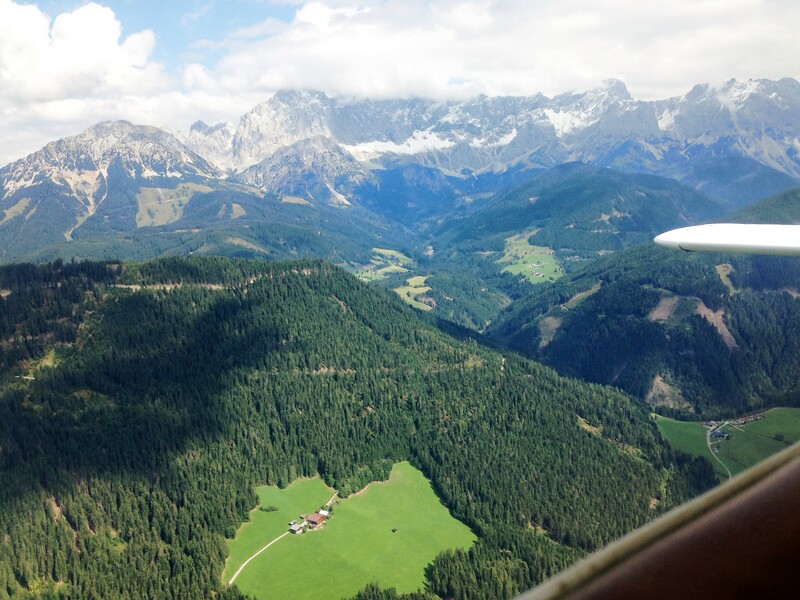 After flying over some stunning mountains – up to about 8,000ft – and through delightful valleys, we were in the area of his family home. However, despite flying around in circles several times, we couldn’t find his house (it looks very different from the air, says Andrei!) so we headed South East to Cluj. 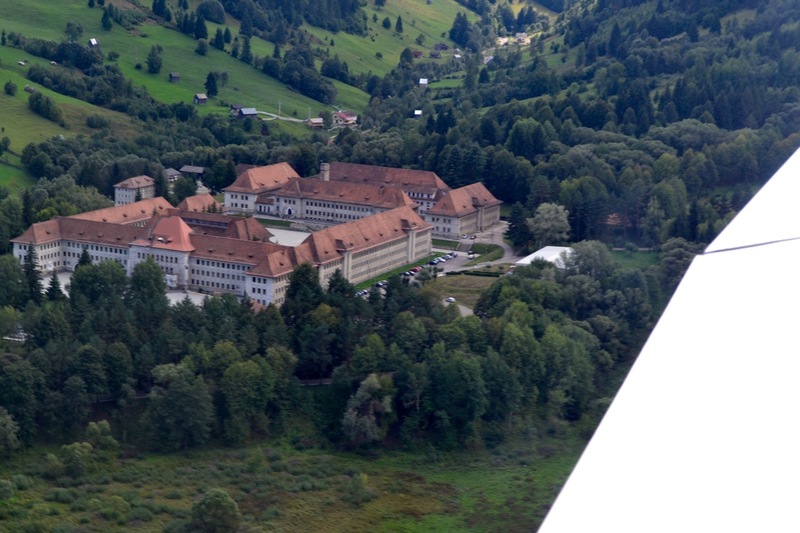 From Cluj, we flew to Ghimbav which worryingly is only shown as a heliport on Skydemon. Turns out they also have a nice long runway! We had a couple of communication issues reaching them on the radio, but just as we were about to fly on to the next airfield, they cleared us to land on runway 21. Due to the delays with fuel at the start of the day, we were now getting short of sunlight hours. 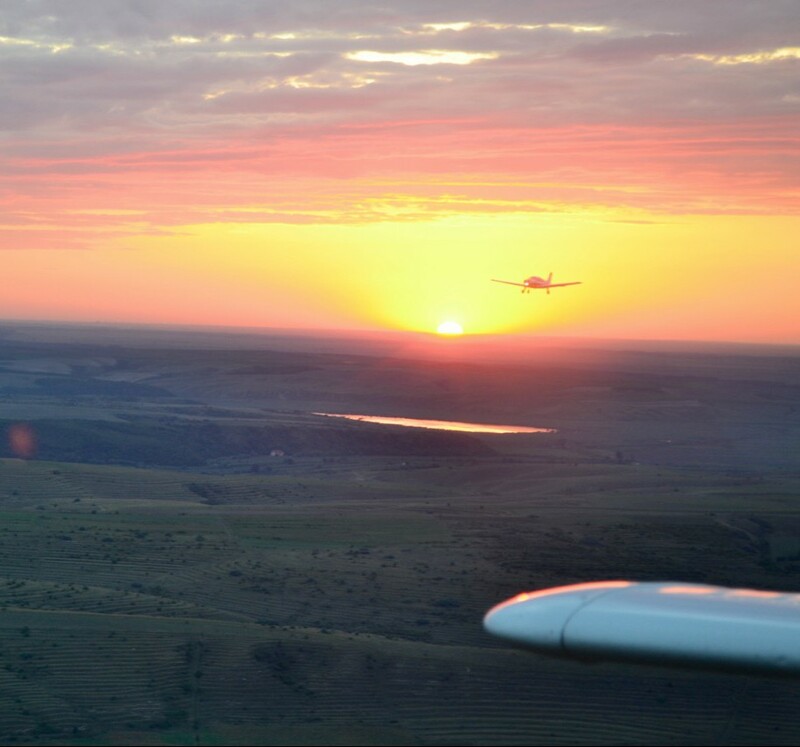 After paying the landing fee we went straight back to the aircraft and quickly got into the air. 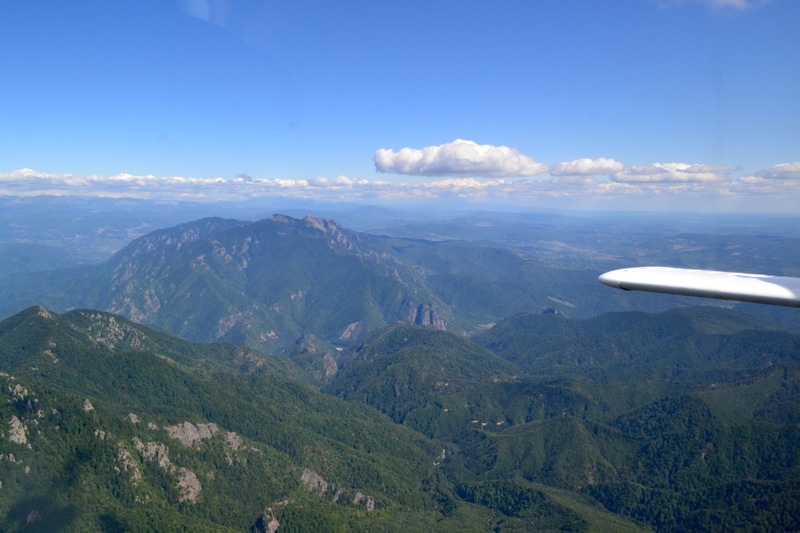 The final leg of the day to Tuzla would take 1 hour 20 minutes, and was a straight line over very flat and feature-less terrain. To make it more interesting, we practiced some more formation flying as well as a spot of low level flying. We got some great views of the vast cattle fields and rivers below. We reached Tuzla airfield just as the sun was setting, making for a wonderful approach with the Black Sea glimmering in the twilight. After landing, we grabbed our gear and headed to another taxi. First problem of the trip: turns out the Hotel Tuzla we had booked was actually in Bosnia and Herzegovina, over 1000 km away! After a couple of frantic phone calls, disaster was averted and we were heading to our newly-booked hotel for the evening. 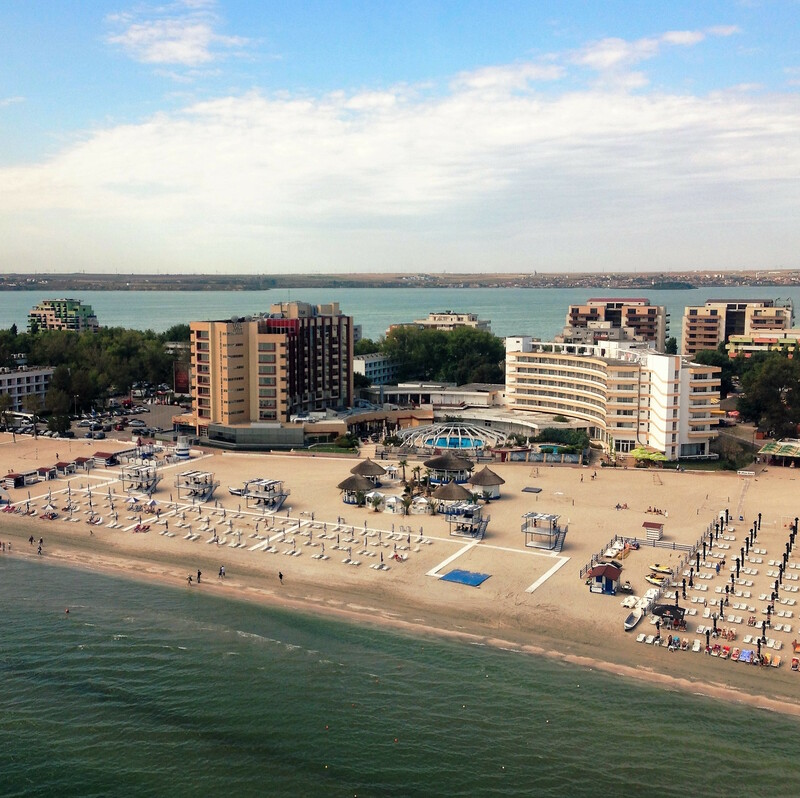 Tuzla is a popular Romanian seaside resort, with lots of entertainment and activities going on. After dinner, we enjoyed some live music and dancing, as well as a performance from a fortune-telling budgie!